The Big Ten Academic Alliance is a consortium of Big Ten Universities plus the University of Chicago which is intended to foster collaboration between its member universities. In addition to its many other activities, the BTAA offers a service called the CIC mobile environment (CICme) which is intended to foster collaboration. CICme uses a login service called Shibboleth, which allows the federation or sharing of login credentials between organizations. Thanks to Shibboleth, participants in BTAA committees can securely login to CICme using their campus-specific usernames and passwords. 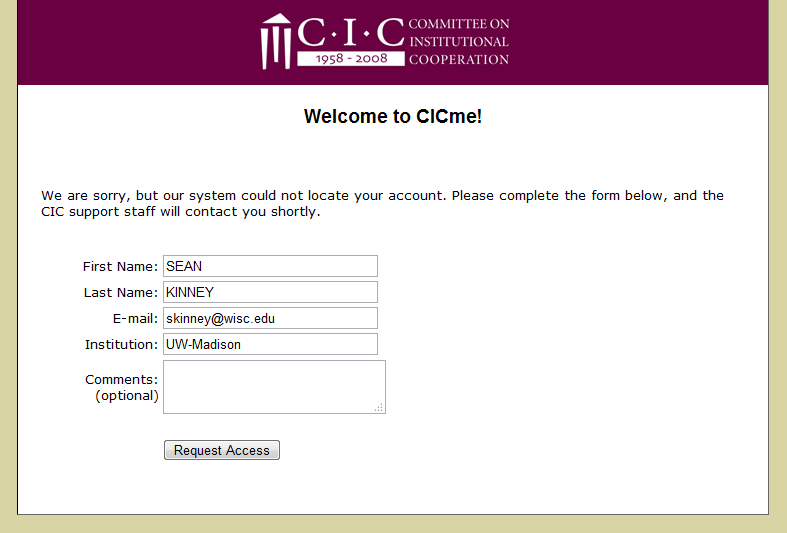 For UW-Madison committee members, this means that they can login to CICme using their NetID and password. The DoIT Help Desk can assist with NetID login issues that arise when accessing CICme. However, issues using the CICme application or questions relating to the CICme account creation process should be addressed to cicsupport@staff.cic.net. Select University of Wisconsin-Madison as your institution, as shown below, and click Continue. You should then be redirected to the NetID login screen which you normally see when accessing My UW, as shown below. Enter your NetID and password and click Login. After logging in, you may briefly see the screen shown below. However, you should be redirected away from this page after a few seconds. If you have previously setup a CICme account, you should then be logged into the service. If this is your first time accessing CICme, you will need to create a CICme account as described below. 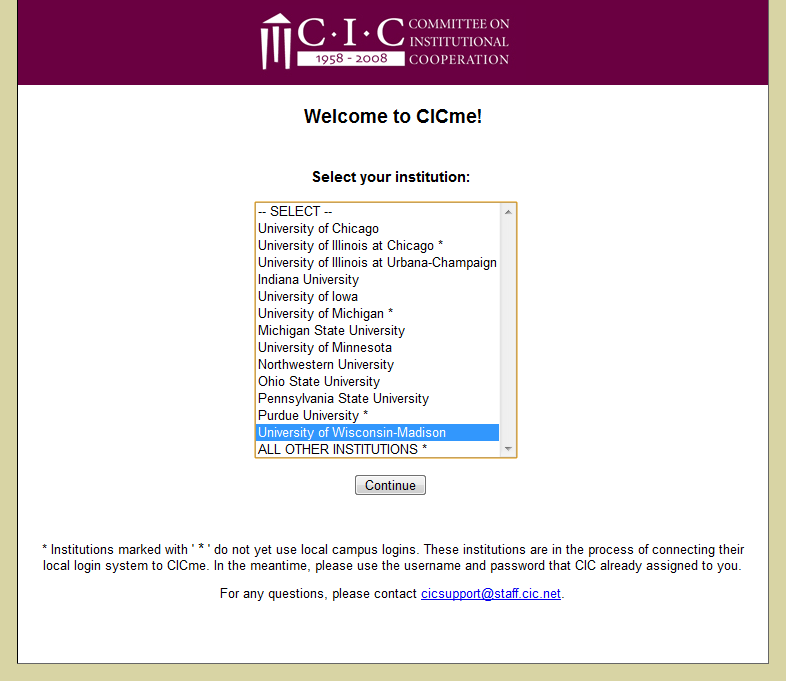 If this is your first time logging into CICme, you will need to create a CICme account. After logging in, you should see a request for information, as shown below. Confirm that your name and email address are correct, enter UW-Madison in the Institution field, enter the BTAA group or committee for which you need access in comments, and click Request Access to complete this process. Once submitted, you should see the confirmation page shown below. CIC will then process the account creation request. For questions regarding the CICme account creation request, you should email cicsupport@staff.cic.net for assistance.